Tetris was originally designed and programmed by computer engineer Alexey Pajitnov in 1984, while he was working at the Academy of Science of the USSR in Moscow. He derived its name from the Greek numerical prefix “tetra-” (all of the game's pieces, known as tetrominoes, are made up of four segments) and “tennis”, Pajitnov's favorite sport. 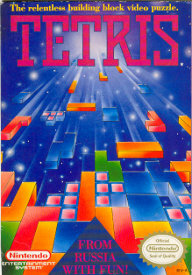 While versions of Tetris were sold for a range of 1980s home computer platforms, it was the hugely successful handheld version for the Game Boy launched in 1989 that established the reputation of the game as one of the most popular ever. Music A in the original Game Boy edition of Tetris has become very widely known. 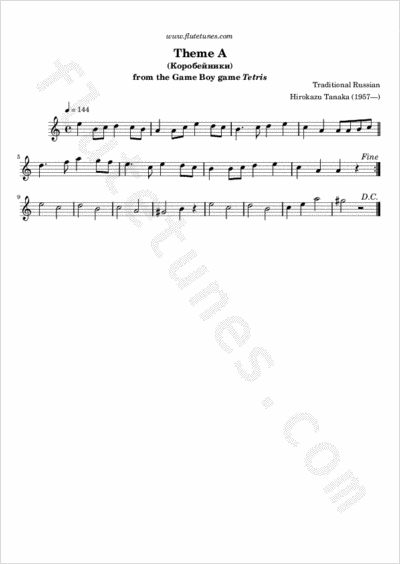 It is an instrumental arrangement of a Russian folk tune called “Korobeiniki”. Korobeiniki were peddlers with trays, selling fabric, haberdashery, books and other small things in pre-revolutionary Russia. The original song tells the story of a young Korobeinik trying to sell his goods to a girl named Katya.